Since 2012, the Boone County Sheriff’s Department has offered K9 training to Mid-Missouri area law enforcement agencies. Our staff conducts training year round for new K9 teams and provides ongoing K9 maintenance training. We offer an eight (8) week Dual Purpose Handlers course or a four (4) week Narcotics Detection Handlers course. 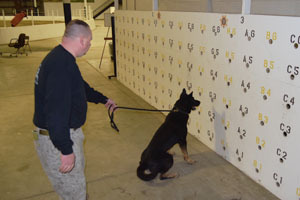 The Narcotics Detection Handlers course only covers Obedience and Drug Detection. The eight (8) week Dual Purpose Handlers course covers all aspects of a Narcotics Detection/Patrol K9 Unit. The Dual Purpose Handlers course incorporates classroom instruction, but is heavily weighted with hands on dog training. Classroom training includes breed history, scent theory, K9 first aid, report writing record keeping, tactics and officer safety. The Dual Purpose Handlers course is a strenuous, hands-on course, where the new handler will actually learn as he trains his dog. During the course, new handlers will train their dog in obedience, narcotics detection, tracking, building search, area search, article search and K9 aggression control. Handlers will work in a variety of environments and various times of the day. 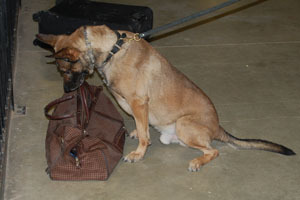 The department also offers a four (4) week Explosives Detection Handlers course. We strive to train well-rounded, social police dogs and believe that an on-going maintenance training program is key to an agencies success. Maintenance training is structured to cover all program areas, including K9 problem solving, scenario based training and still be flexible enough to address any performance issues. Working dogs require physical and mental exercise to keep them and the handler engaged and operating at their best. For new or re-train K9 teams training will culminate with the K9 team obtaining certification through Missouri Police Canine Association (MPCA) and/or North American Police Work Dog Association (NAPWDA). Maintenance training also includes certification testing through MPCA and/or NAPWDA. Training is conducted by a certified Missouri Police Canine Association and North American Police Work Dog Association trainer. If you are interested or have questions about the program, please contact Deputy Chris Smith at CSmith@boonecountymo.org. The Boone County Sheriff’s Department K9 Unit started in 1993 and is currently authorized for three (3) fulltime K9 teams. The canines are dual purpose and trained with their handlers over an eight (8) week K9 handler course. In addition, the K9 teams participate in weekly maintenance training. Each K9 team is annually certified through the MPCA and NAPWDA. All of our dogs are dual purpose, trained in both narcotics detection and patrol. Each K9 unit vehicle is equipped with a custom kennel, fan and a temperature monitoring system. The purchase and care of our dogs has primarily come from generous donations made by the community. We wish to thank everyone who has contributed to the K9 program over the years. Thank you for supporting the K9 program!